Lentils are a good source of protein and is equivalent in its nutritional properties to meat. It is rich in amino acids, vitamins and minerals. Besides, lentils are virtually fat-free. This environmentally friendly product is tasty and healthy and unlike other beans, prepared relatively quickly. 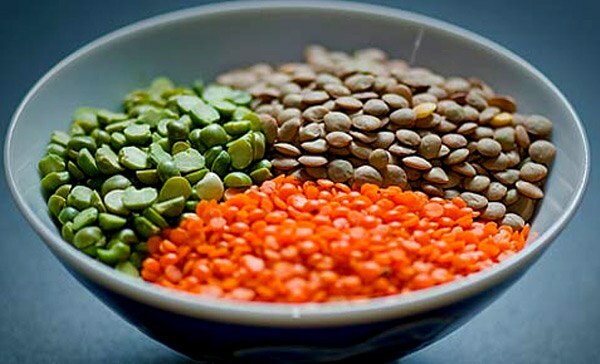 There are many varieties of lentils, but from the variety of the most popular French green lentils, brown and red Egyptian. The cooking time of lentils will depend on its variety. The longest is preparing the green, it holds its shape well and not fall apart, brown is brewed much faster, and if overtime on fire, can turn into a mess, red – perfect for mashing. Prior to cooking the lentils soaking is not necessary, but it must be thoroughly washed under running cold water and put in already boiling water. Usually take 1 part legumes with 2 parts of water. Preparing the lentils on low heat from 15 to 45 minutes (time depends on the type of lentils). Periodically it is necessary to stir. Because salt slows the cooking process, adding it should be full shortly before the lentils are tender, about 5-7 minutes. The same applies to tomatoes. In addition to salt to the lentils, you can put different spices and herbs: Bay leaf, rosemary, sage, cloves, celery, garlic. It will give the dish the extra flavors. To the beans turned out soft and tender during cooking should be poured into the water a half tablespoon of olive oil. Lentils rinse well. In a saucepan, pour cold water and boil, then put the lentils and cook it on low heat. Onion peel and cut into small cubes, carrots and celery peel and grate on a coarse grater, and bell pepper – julienne. Then fry the vegetables in vegetable oil. After about thirty minutes after the start of cooking, add the lentils to the sauteed vegetables and season with salt. When necessary, dilute with preparing the broth boiling water to the consistency of soup and boil the lentils until cooked, about 10 minutes. At the end add the chopped garlic cloves, Basil and marjoram, and purified from the skin and diced tomatoes. Boil all together for 5 minutes. Before serving, sprinkle a mess of pottage parsley, cook separately and serve croutons of rye bread. Green lentils is very useful because it contains large amounts of protein. Meals are produced from very hearty and flavorful. To cook green lentils can soups, side dishes and salads. 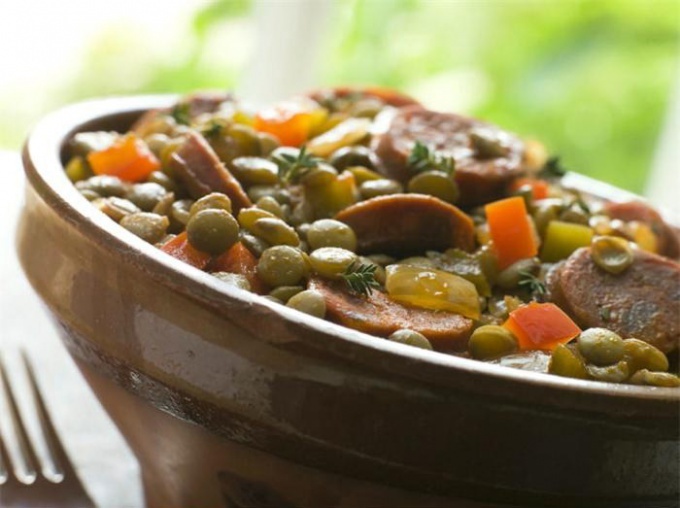 To prepare the soup of green lentils measure out 300 grams of cereals and pour 1 liter of chicken broth. Add to the pan 1 chopped onion and 1 crushed clove of garlic, bring broth to a boil. Cook until tender lentils, after which the contents of the pan turn into a puree with a food processor. Season with salt, pepper and add 200 grams of roasted bacon, cut into small pieces, or the same amount of smoked sausage. Sprinkle the soup with some chili pepper and stir. Serve with sour cream. Prepare a salad. To do this, boil one Cup of green lentils until soft. One chicken breast cut into small pieces and fry in vegetable oil for 5 minutes. One onion and 2 tomato chopped, diced, and half a tin of black olives cut into rings. Add the 3 tablespoons of capers and cook the sauce. Mix 80 grams of olive oil with 2 tablespoons of vinegar, salt and pepper to taste. Add sauce prepared salad and sprinkle with chopped parsley. For cooking green lentils with spinach cut into rings one large onion and peel 2 cloves of garlic. In a saucepan, pour 600 grams of water, bring to the boil and add 200 grams of lentils, onions and garlic. Cook over low heat until cooked grains, then drain the water. Two cloves of garlic chopped as small as possible. In a deep frying pan melt 3 tablespoons of butter and fry in it one chopped onion and garlic until Golden brown. Place in pan with 300 grams of spinach and fry until then, until all the liquid is evaporated. Then add the green lentils, 2 tablespoons of sour cream and mix. Season with salt, ground black pepper and 3 tablespoons of lemon juice. For salads perfect green (French) lentils, it almost does not fall apart and blends wonderfully with other ingredients. Green lentils in boiled form resembles a coin. So here is the recipe for "Cash salad", which can be cooked for any occasion (and without it). A glass of green lentils boil (see previous recipes). Recipes with lentils. How to cook lentils? Method and cooking time of lentil in is largely dependent on variety. If you cook French green lentils, then do not worry because she will fall apart. Of all the varieties of green itself resistant to cooking. To cook brown and red Egyptian lentils, it will take much less time.